University of Michigan research shows web-based system could help improve detection and response to spread of illnesses. There is growing trend toward the use of “biosurveillance” – Web-based systems to track public health, many times with an added predictive model. As you’ll see in the University of Michigan press release below, a familiar sales pitch is employed to assert that the only way to keep the public safe is through pervasive surveillance … now including preschoolers. With Ebola taking center stage as the latest threat to humanity, along with new concerns over enterovirus EV-D68 which is afflicting children in increasing numbers, the surveillance state is not letting a single crisis go to waste. 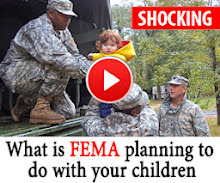 Embedded in all of these missions, naturally, is a drive to ensure a wider adoption of vaccines, perhaps making them mandatory under medical martial law. As the climate of fear begins to hit a fever pitch, we would do well to consider which is more frightening: the virus of the week or the permanent solutions currently being offered. A web-based system that allows preschools and child care centers to report illnesses to local public health departments could improve the detection of disease outbreaks and allow resources to be mobilized more quickly, according to University of Michigan research to be presented Saturday, Oct. 11 at the American Academy of Pediatrics (AAP) National Conference & Exhibition in San Diego. Researchers who designed the biosurveillance system will describe how it can be used to track illness trends and improve public health response to outbreaks during a presentation at 2:09 p.m. PDT in Marina Ballroom Salon E at the San Diego Marriott Marquis. “For example, if certain child care centers are reporting the beginning of stomach flu (vomiting and diarrhea), other centers can start taking steps to thoroughly clean to kill any viruses before symptoms occur or before a major outbreak takes place,” says Andrew N. Hashikawa, M.D., F.A.A.P., a pediatric emergency physician at the University of Michigan’s C.S. Mott Children’s Hospital. In addition, if child care providers see that larger centers in their community are reporting flu-like illness, they can use the data to emphasize to parents the need to have their children immunized against influenza sooner rather than later, says Hashikawa, who also is assistant professor in the Department of Emergency Medicine and Pediatrics at the University of Michigan Medical School. Children under age 5 generally become sick earlier and more frequently than school-aged children and adults because their immune systems are underdeveloped. Young children often are responsible for spreading viruses to the rest of the community. Previously some public health departments have found that school absenteeism as a marker for illness was imprecise, delayed, and unavailable during summer and winter breaks. “However, child care or preschool absences are typically more likely to be associated with illness and most young children continue to need child care for most of the year,” says Hashikawa, a member of the U-M Institute for Healthcare Policy and Innovation. Most public health departments do not electronically track influenza or stomach illnesses in preschools and child care centers settings. “Most illness reporting methods used by many public health departments are slow, paper-based and inefficient,” says Hashikawa. To improve reporting, Hashikawa and his colleagues created a computerized system and tested it at four early learning centers in Michigan. Staff were trained to use the system daily to report any ill child. No confidential or identifying information was collected. They entered data on illness type and symptoms in seven categories commonly seen in preschoolers: fever, influenza-like illness, pink eye, stomach illnesses (gastroenteritis), cold or respiratory symptoms, ear infections and rash. They also entered the age range of the ill child (infant, 0-12 months), (toddler, 13-35 months) or (preschooler, 36-59 months), daily attendance at their center, and action taken (e.g., child brought to a physician). Researchers sent data electronically to the public health department weekly or more frequently if spikes in illness cases were seen. Results showed centers reported 188 individual episodes of illness from Dec. 10, 2013, through March 28, 2014. Nearly 15 percent were infants, 32 percent were toddlers and 54 percent were preschoolers. The most common illnesses reported were gastroenteritis (37 percent), fever (31 percent), cold (17 percent) and influenza (3 percent). Data also revealed an unusually large increase in gastroenteritis cases during a two-day period, which was comparable to a countywide spike among schools reported three weeks later. “Preliminary data suggest that using the online biosurveillance in child care centers and preschools gives us an earlier detection and warning system because the younger children appeared to become sick first compared to middle school and high school aged children within the community,” says Hashikawa. To view the abstract, “Implementation of Web-Based Surveillance of Illness in Early Learning Centers: A Pilot Study,” visit https://aap.confex.com/aap/2014/webprogrampreliminary/Paper25005.html. About C.S. Mott Children’s Hospital: Since 1903, the University of Michigan has led the way in providing comprehensive, specialized health care for children. From leading-edge heart surgery that’s performed in the womb to complete emergency care that’s there when you need it, families from all over come to the University of Michigan C.S. Mott Children’s Hospital for our pediatric expertise. Be the first to comment on "Get Ready for BioSurveillance of Your Preschooler’s Health"